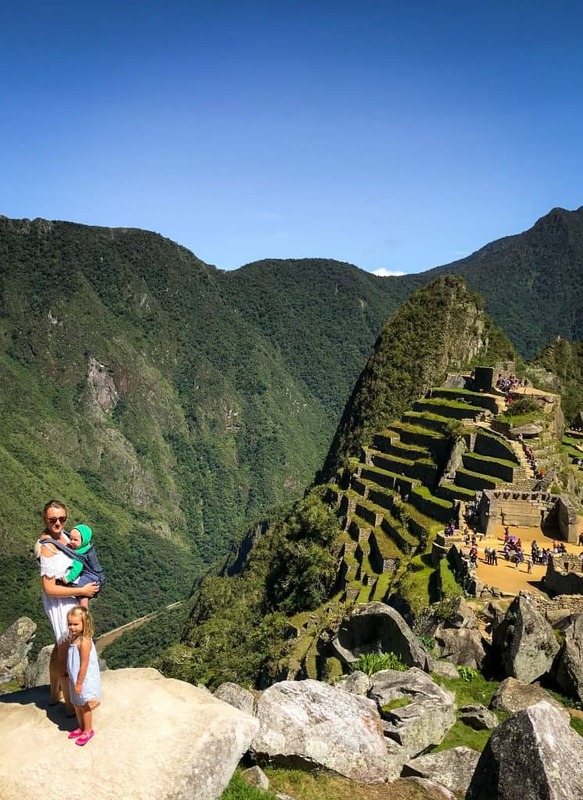 Visiting Machu Picchu with a baby and a toddler seems like a far flung idea to most. The altitude, the hiking, the water and food, how did we manage? These are some of the hundreds of questions I got asked on social media when we visited. 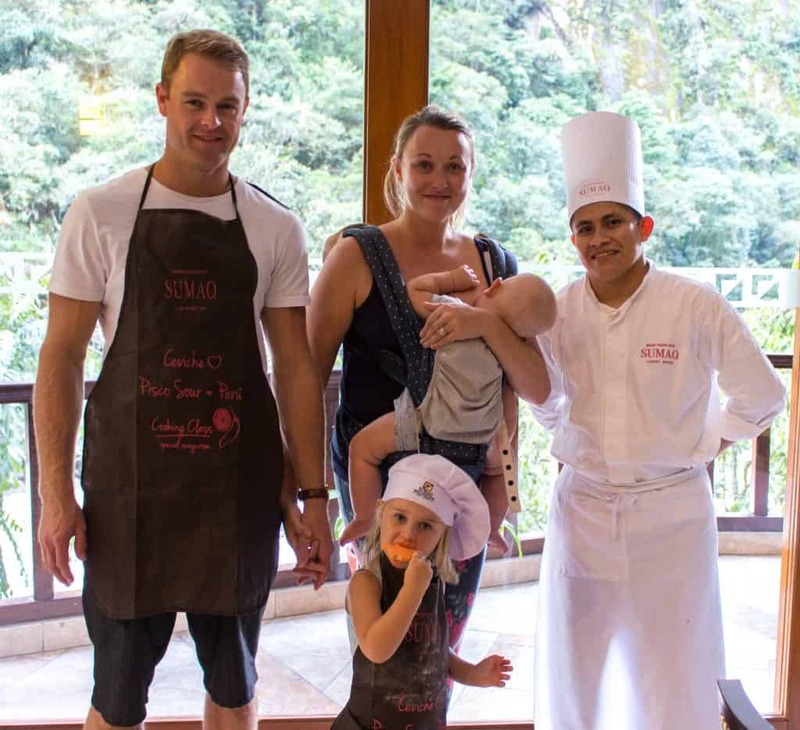 It seems there is a lot of confusion about how to get to Machu Picchu with kids. Lets just say we did it the lazy way. We flew from Lima to Cusco, took a taxi to Sacred Valley, and finally took a train to Aguas Calientes where we stayed for three nights. Our hotel was just twenty minutes from the entry to Machu Picchu, so it was very easy and accessible. We are not the sort of tourists that go to typical landmarks and sites. However, I am so glad we made it to Machu Picchu. I have visited 80+ countries and there are very few experiences that I would describe as ‘magical’. Everything from the moment of arriving at the Inca Rail Station, and our stay in Aguas Calientes, to the pinnacle moment of seeing Machu Picchu. All I can say is WOW! Some might ask did the kids enjoy it? I can hand on heart say YES! We found the perfect balance of kiddie activities and site seeing. 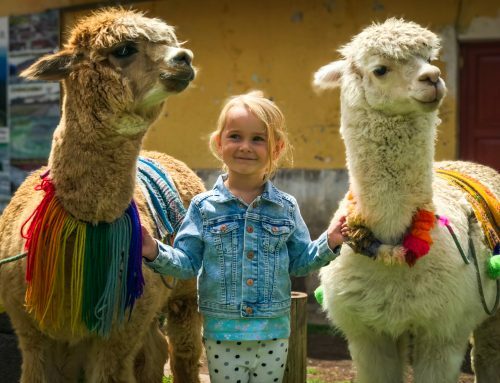 Although they are not that interesting to a 3 year old and a 7 month old, you should check out the ruins around Cusco or check out this Peru itinerary if you have time to explore past Machu Picchu. I have written this blog with a lot more information than my usual format. At the end you will see a list of tips and information about planning your trip. But for the more interesting part, this is our play, sleep and eat guide to Machu Picchu with kids. We got up early on our first morning and aimed for the 7am bus. 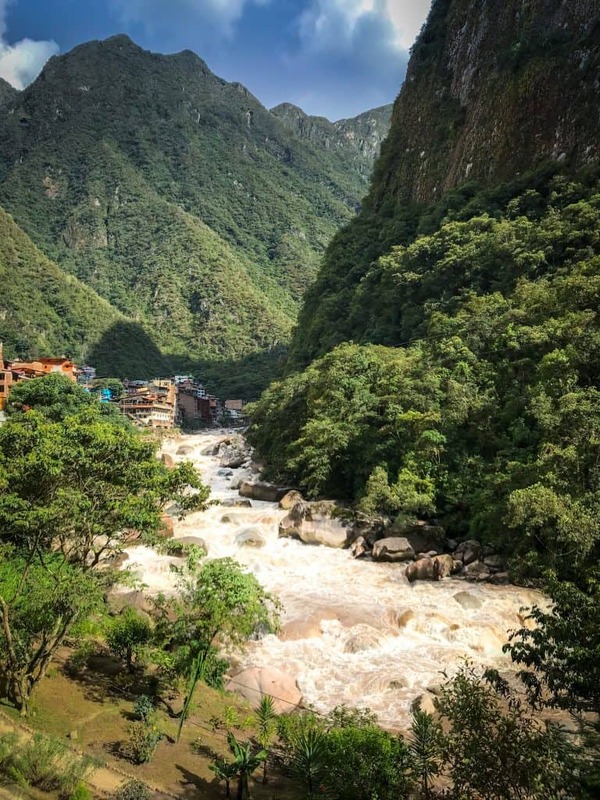 It only takes 20 minutes from Aguas Calientes. We visited in low season, so everything was less busy than usual and it was perfect time to visit. That said, it was a little risky, the weather is very temperamental. However we were in luck, and had a perfect day with blue skies. On entering, there are two routes. The one going up to the left gives the typical and most photographed view, and the one straight ahead is the lower end. We opted to go up before the morning sun got too much with the kids. It was perfect in every single way. There was a refreshing breeze and it felt incredibly nostalgic. You know when you’ve seen something so many times, and when you visit it doesn’t feel real? It felt like I was dreaming. It had an eery feel, not a bad one. A feeling of grandeur, imposition and perfection! Pictures and descriptive words don’t do it justice, we will never forget its beauty. Funnily enough, we were the only ones carrying a baby, and the only ones wearing flip flops! We didn’t feel we needed hiking shoes, but I guess if everyone else was wearing them, it should be considered. 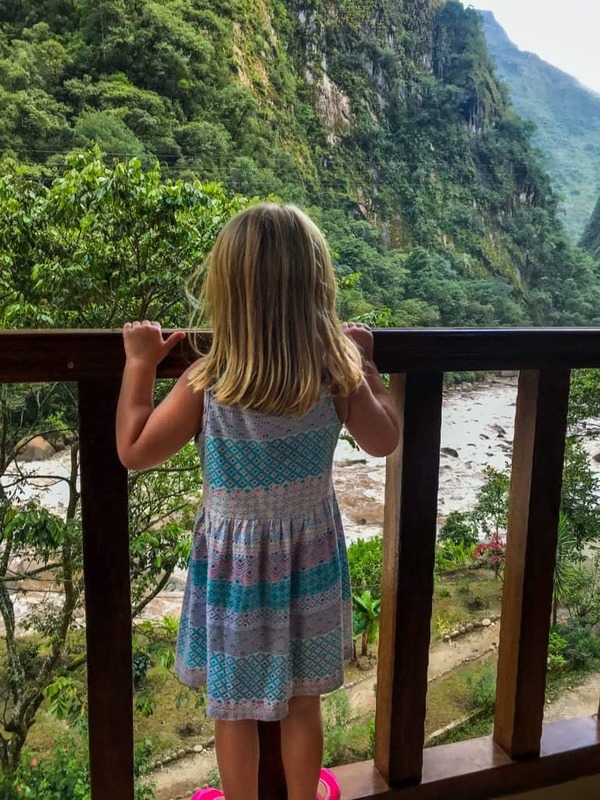 Esme, is only three but she definitely had an appreciation for the beauty of Machu Picchu. She said ‘wow look at that mummy’ a few times. The obvious situation that really caught her attention was the overtly friendly and lovely alpacas! After our amazing morning we made our way to the front gate, got the Machu Picchu stamp in our passport and jumped back on the bus to Aguas Calientes. Aquas Calientes is a small town filled with restaurants, cafes, bars, shops with traditional art, crafts and textiles. We only ate out a couple of times, we were totally spoilt at Sumaq with an amazing breakfast, afternoon tea and dinner! Therefore, only needed lunch a couple of times. Unfortunately Sumaq turned us into such food snobs, that we didn’t really enjoy it. Like any tourist hub, there are many people touting on the street, trying to get your business. They promise you lots of extras and it seems like the price of a meal is negotiable. Like any of those situations, the quality of the food is questionable. That said, we loved walking around taking in the stunning views and browsing in the local craft shops. Ordinarily we like to explore by ourselves. We were keen to create a fun situation for our kids to balance out the long journey and site seeing. As we were staying at Sumaq Hotel we found it very easy to do just that! They have the family at heart and are very welcoming of little people. 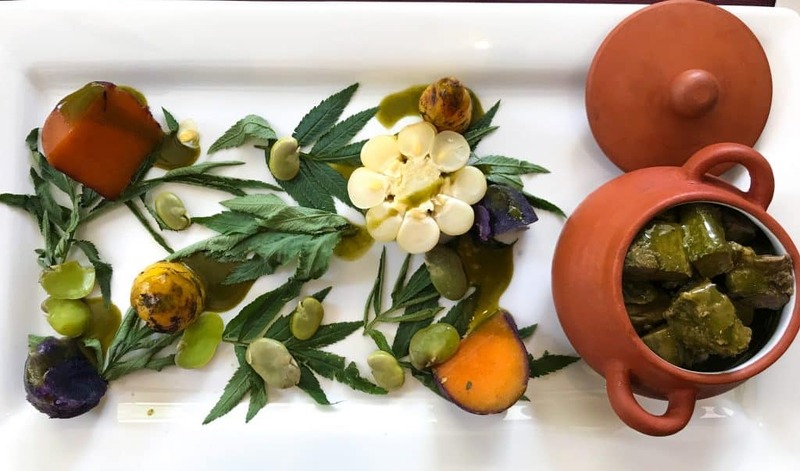 We loved all of the activities they had available, so cleverly designed to embrace the Incan culture, but at the same time entertain and captivate the entire family. 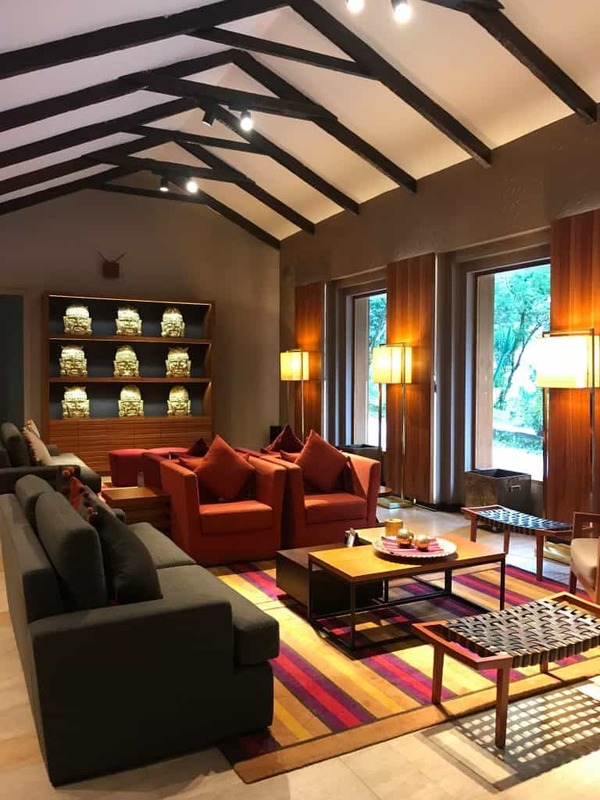 In the afternoon, Sumaq Hotel, set the garden room with gorgeous colourful throws on the floor, big cushions and lots of traditional attire. Like hats, musical instruments and dolls. One of the staff told the kids tales of Incan times. They were more interested in all of the toys on the floor, as they are so young, but they really enjoyed the time. The story was interesting and well told by Victor! Our daughters favourite activity was the mini-chef cooking class. Along with the in-house chef, she made cookie dough, rolled it out, made it into different shapes. After cooking them, she decorated them with icing and had them nicely packed to take away. It was right on time for afternoon tea, so whilst we had a coffee, we all had a nibble of the cookies. 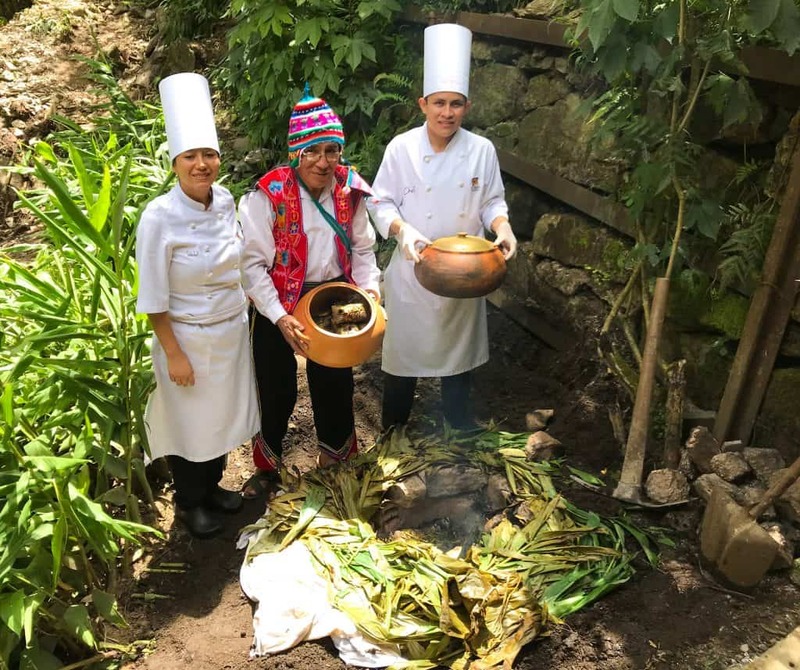 We learnt a lot about Incan traditions and customs during our stay at Sumaq. On our first day, we were invited to a Pachamanca experience, they offer it on request. We were brought to the Garden Room where a traditionally dressed man was awaiting. On the ground there was a hole surround by hot stones. He demonstrated a traditional cooking method. First he layered the hot stones with bundles of fresh herbs. He put perfectly made banana leaf food parcels on top. The preparation was covered with lots of foliage and completely buried with soil. It smoked for a half an hour whilst we sat and tried some traditional grape drinks and ate yummy nibbles. We later ate the ground cooked meal at the restaurant, it was so good! At Sumaq, they call it an offering to the earth ceremony. It was at 6pm in the evening. It was just getting dark and the Garden Room was glowing with beautiful candles. The Shaman, set the area beautifully. Again with throws and cushions for comfort, there were also many offerings to the earth. There were handfuls of corn, seeds, crystals and leaves. He demonstrated and involved us in preparing an offering to the Pachamanca. It was a very peaceful and relaxing experience. Well, it was until our kids had other ideas of throwing the offerings around. Luckily the Shaman was very understanding. He said children and their innocence is the best offering to the Pachamanca. Afterwards, he read our cocoa leaves! He predicted, we would have a third child. I tried not to laugh out loud, whilst I was desperately trying to contain two crazy kiddos. It was a really lovely experience but, given it was witching hour, I would have loved if we could have done it kid free! After all of those amazing classes and activities for the little ones, we were ready for some kid free time. At the spa in Sumaq, they offer lots of different treatments using traditional products and techniques. Travel Mad Dad had a special salt massage and I had a one using heated pouches. The area is tranquil and relaxing with dim lighting and soothing music. It was the perfect escape from the kids to relax. The therapist was so adorable and professional. With over 300 Inca ceramic replicas at Sumaq, the beautifully decorated rooms and the breathtaking view, we really felt at the heart of it! We had a perfect room for a family, with two cozy double beds and a single. There was ample room for all four of us. It came equipped with a coffee machine, bottled water and some really luxurious products. Every day they brought little treats to our room in the afternoon. Everything about Sumaq is luxurious! I loved chilling in our room after a day of exploring, soaking up the views of the river, sipping on a coffee, and cuddling up under the duvet. We have been turned into food snobs! We are waiting for somewhere to compare but it just isn’t happening! Every meal, every plate was fine dining at its finest! Afternoon treats consisted of cakes, mini burgers, vegetable rolls, coffee and fresh tea. It was my favourite! Whilst Esme loved the choices at breakfast. 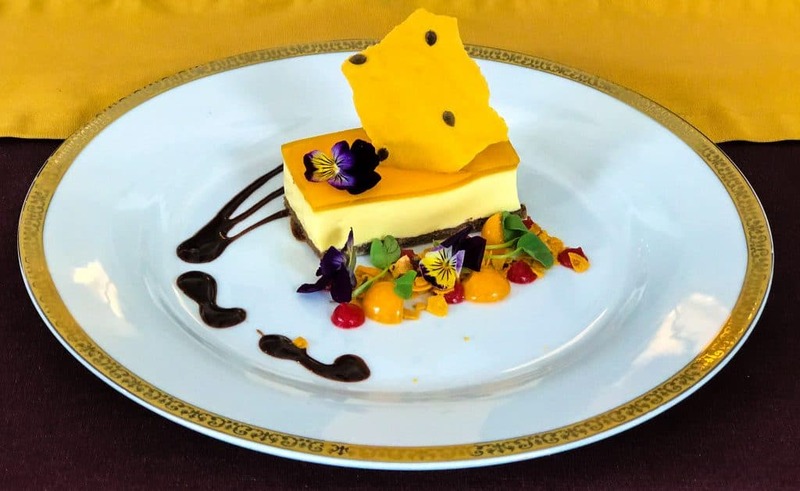 It had everything from quinoa banana bites to fresh fruits, coffees, pancakes, made to order eggs, shot glasses filled with oats and pureed fruits. We generally ate lunch out but they do have a menu during the day. 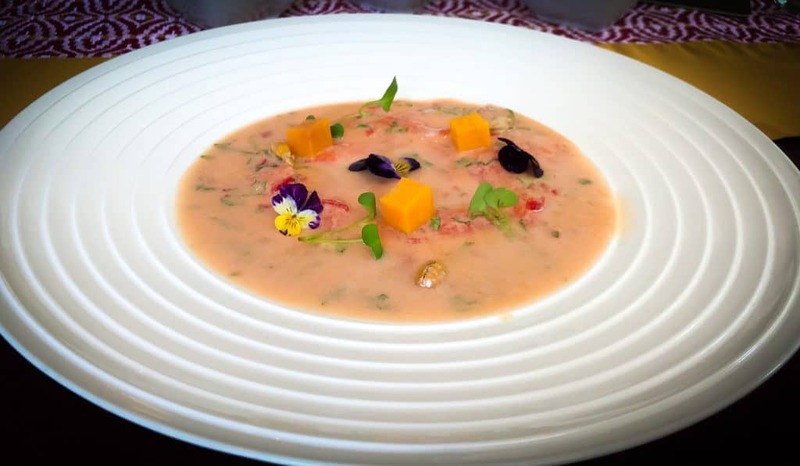 The evening dinner choices were amazing and featured some very traditional dishes, such as trout ceviche, alpaca and so on. As a vegetarian, they were very accommodating with diet requests. The food was so fresh and portions were the perfect size to fit in three courses. Flights from Lima to Cusco cost around 6O USD per person if planned in advance. The price quoted online will often be more once you insert your passport details. This is because Peruvians are given a different price and there is a premium for foreign nationals. If you are concerned about the altitude, its best to leave Cusco straight after arriving. You can pick up a taxi outside very easily. We paid 100 soles (approximately 35USD) for a taxi to Sacred Valley where we took the train. Sacred Valley is significantly lower than Cusco. The taxi takes about 1.5 hours. The two rail options are Peru Rail or Inca Rail. Inca has a slightly better baggage allowance, but its also slightly more expensive. We took the regular ticket but there are flash first class experiences. If you are bringing a baby, you have to go to the Inca Rail desk with the passport to prove baby’s age thirty minutes in advance of the train leaving. We were told we could have one 8kg bag each for Inca Rail. They have free storage for anything we didn’t need at the station. They were very lenient with our allowance when they saw we had two kids and were staying for three days. The train takes around 1.5hrs, its incredibly scenic and beautiful. They give a little snack and a nice drink which will keep the kids busy for a while. Read this if you want to understand what it’s like to do the Machu Picchu mountain hike! You have to buy your ticket to enter the Machu Picchu site in advance. They only allow a certain amount of tickets per day. You can purchase a morning or afternoon ticket on the official governmental website here. 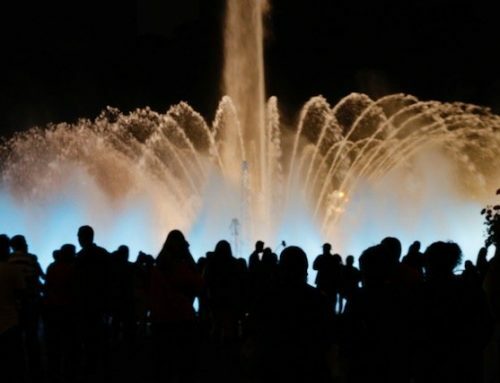 It costs 152 soles per adult. Children under 6 go free. Make sure you complete the purchase. They let you reserve for an hour and the email seems like its confirmed, but it is not until you have paid. Most hotels offer a collection from the rail station in Aguas Calientes. It might be useful to tell your hotel what time you arrive so they can help you to your destination. When you arrive at Agua Calientes, book your bus ticket to Machu Picchu for the next day. The buses leave from close to the rail station every 15 minutes. We heard the queues in the morning to take the bus from Aguas Calientes are really long. Everyone wants to be there for sunrise. We took the 7:15am bus during low season and we got on straight away. The bus takes twenty minutes winding its way up the mountainous road. You have to bring your passport as proof of identity. There are lots of tour guides hanging around the gate at the ready to take you for a tour. With two kids and wanting to do things at our own pace, we were happy doing it by ourselves. It took us about 2.5hrs to walk around the site, take photos and of course hang out with the alpaca’s. 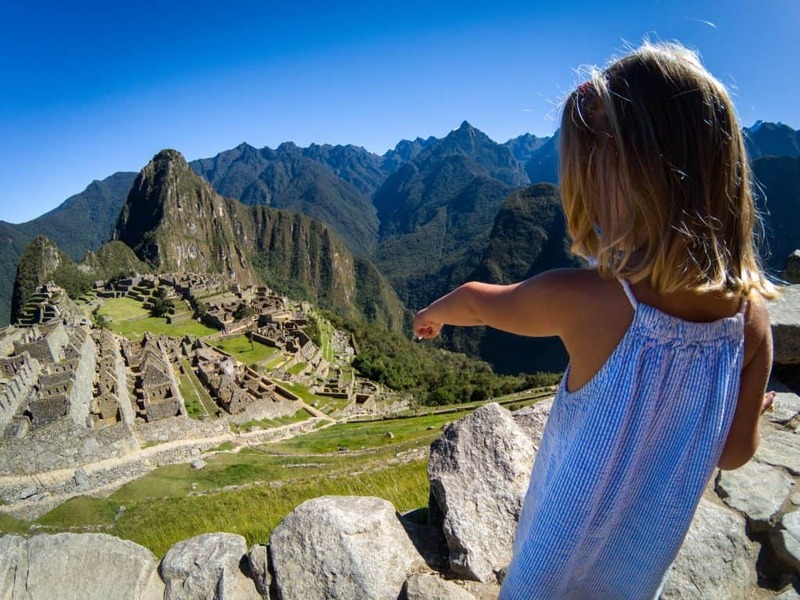 Have you found Machu Picchu with kids helpful? Leave a comment we love to hear from you. If we’ve helped you in some way, we would love if you could help us too. In this digital age there is a demand for immediate information online. Being a patron is a new-age way of giving a small token of appreciation for this information, which takes time to put together, with no financial return. We offer exclusive access to blog posts before they are published as a thank you. We also offer travel advice and consultancy at different payment tiers. You can sign up to our Patron program here. Disclaimer: This post Machu Picchu with kids, has affiliate links. Some of our stay was complimentary in return for an honest review. As always all views expressed our entirely my own. 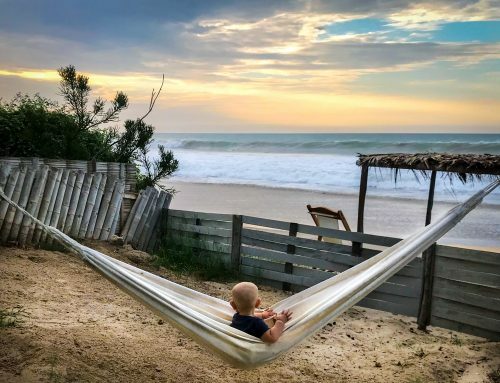 You may also like: Mancora, Peru with Kids. Did Sumaq offer babysitting while you were there, or did you switch off for spa time? We went to Peru for a friend’s wedding when I was pregnant with our daughter and we would LOVE to go back. 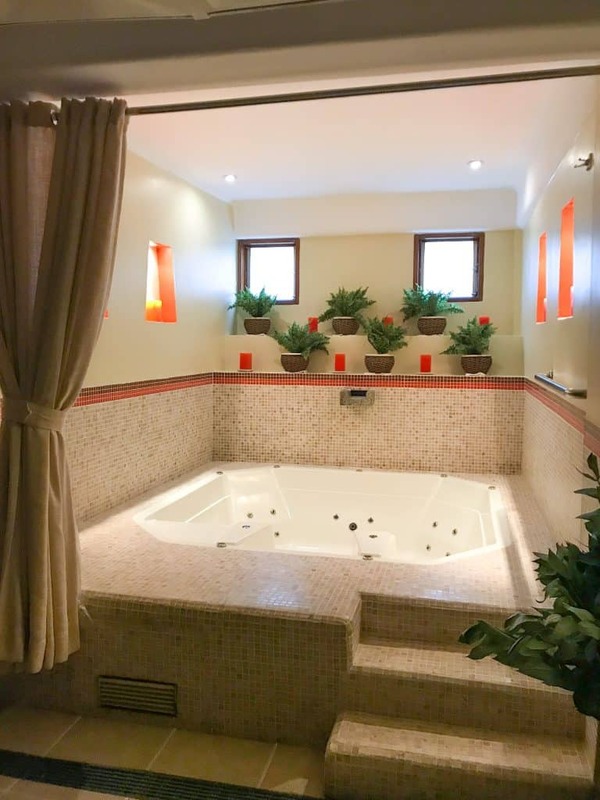 Your spa treatments looked so delightful that it would be heavenly to have a few child-free hours to relax together. We can’t wait to get there with our kids !! Thank you for this Review ? it will be a great help ! 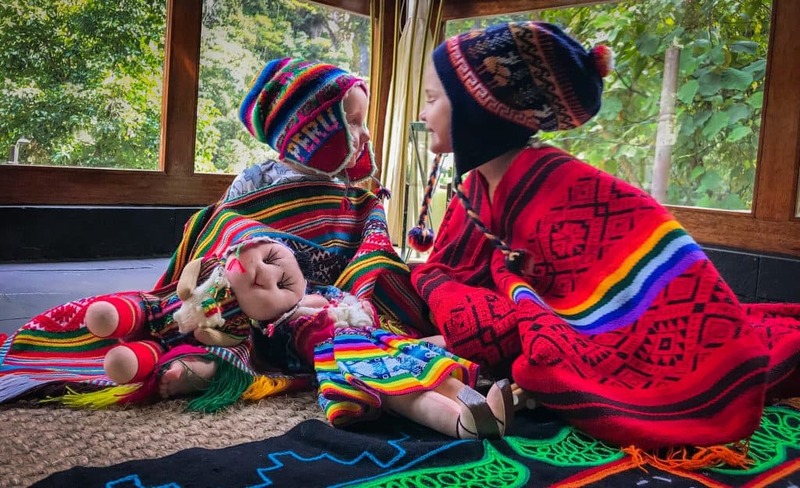 Super inspired by this, i have always wanted to do Peru but always assumed it would be a me and hubby trip and leave the kids at home but now I’m seriously reconsidering it for this year with our 3 yo and 2 yo. Macchu Picchu is somewhere I have always wanted to visit. My Dad went on his own as a bit of a mid-life crisis and loved every second of it, but somehow all his photos got lost when he took them to be developed (pre-digital cameras). He died very unexpectedly three years ago and I’d love to follow his footsteps and visit it myself. I can’t imagine doing it with kids but you make it sound very easy. Great tips as well! What amazing photos Karen! It really does look magical. One day we will get to South America, it really is a huge whole on our travel map. Wonderful photos Karen and I did laugh about the 3rd child! Now it’s been predicted! Who knew cocoa leaves could tell the future? WOW! I lived and worked in Venezuela for a few years but didn’t get a chance to visit Machu Picchu and I really regret it. What an amazing experience for your kids. Sumaq looks like an absolute dream place to stay as well. 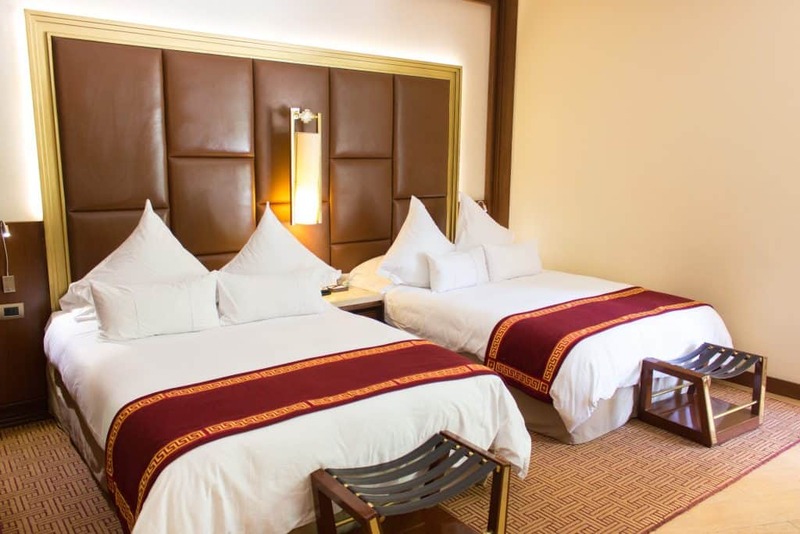 Sumaq Hotel sounds incredible and so family-friendly. The kids throwing around the offering made me laugh. Mine would have be lobbing the stones!!! 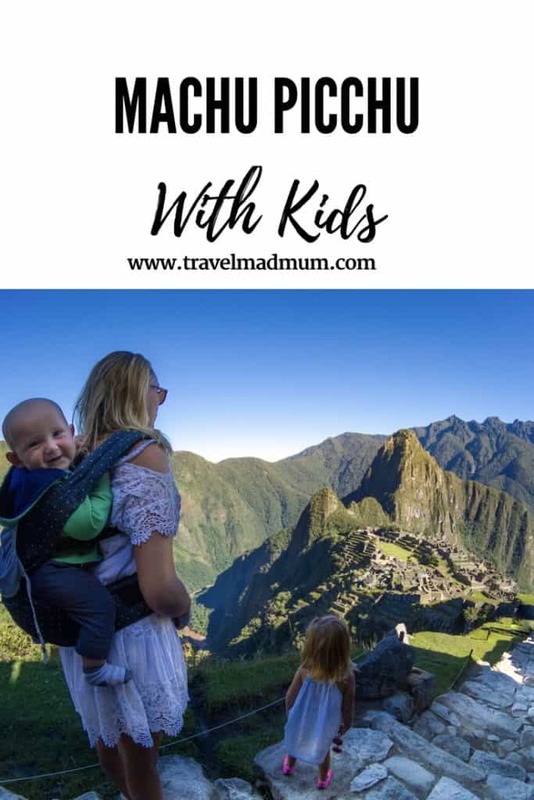 Greta tips for doing Machu Picchu with kids and brilliant that it was so close to where you were staying. What an incredible experience for you all! I would love to learn more about the Incan traditions and culture. 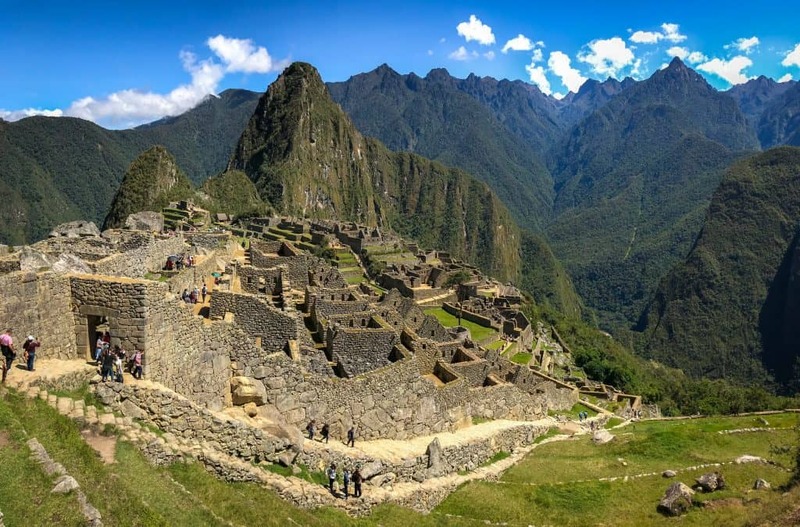 What an amazing experience – I would love to do this with my daughter, and I guess because so many people write about doing the Inca Trail to get there, it’s easy to forget there are easier alternatives. What a fantastic fanily-friendly place to stay as well, those activities would definitely capture my daughter’s attention. How did you find the altitude as that’s one thing which I’ve wondered about? This post is proof that it IS worth doing these things with young kids. Even though they might throw things round in front of Shamans! It sounds as though your daughter was so impressed that the trip will be something she remembers, despite her young age. its the I angel carrier. I have a discount code if you fancy? This may sound like a silly question, but were you worried about your 3-year-old falling off the cliffs? I want to go to Macchu Picchu with baby, 3-year-old girl and four-year old boy…that means hubby and I will be outnumbered by children, and I am wondering how risky it is…Would we need to hold their hands the whole way? I am in the middle of planning a random trip to Peru in two weeks with a five year old and a eight month old! So glad I found your blog! We are staying three nights in the Sacred Valley. Do you think three nights in Machu Picchu is too many? We enjoyed resting up for a while especially with the baby. We also did three nights but two is realistically plenty. this is a very helpful detailed information to help new visitors reach the best experience when deciding to go. 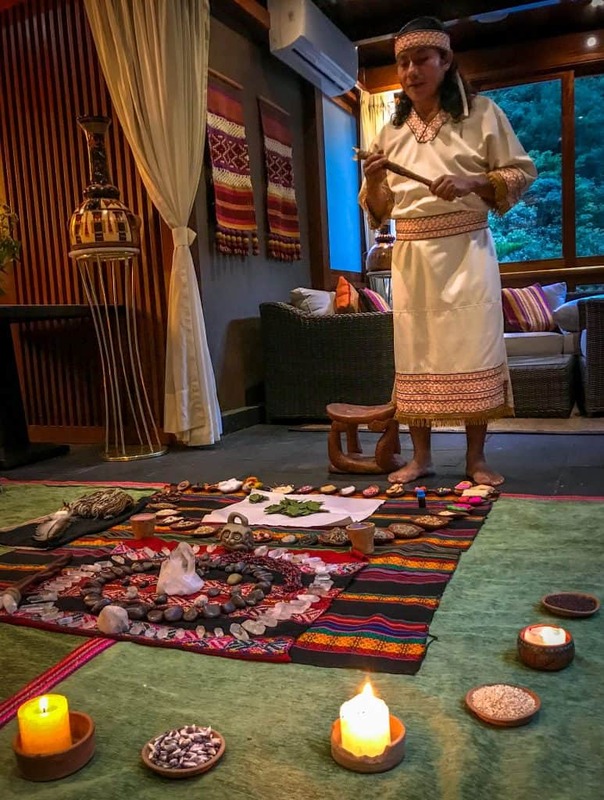 I have traveled with my child and daughter too and Inka Challenge Peru booked me a very helpful treatment for me going with family to have a machu picchu tour. Great info. I would add, that children’s (ages 8-17) tickets cannot be purchased through the official ministry website. You must use a tour agency to purchase those tickets. Also, it is now required that you have a guide at Machu Picchu. You cannot enter without one. I learned a lot from your post and we book similar itinerary with my child. Thanks a lot for sharing your experience! How do you find food and water over there? Did you take any vaccine for your family? Any concerns/tips for fruits juice if we eat them mainly at the hotel? Thank you. PS: I am suggested by doctor to take dukoral.